Design Data's SDS/2 Code Clash 2010 parametric competition will highlight the creative minds of SDS/2 users — and promote the creation of parametrics within the SDS/2 community — by awarding prizes to parametrics and their authors. Any current SDS/2 customer with a flair for innovation and some programming skills can submit a parametric into the competition, which runs from July 12 through September 17. Design Data will judge all entries, with prizes to be awarded at the annual SDS/2 Users Group Conference October 21. Parametrics will be judged in five areas — usefulness and creativity; documentation and help; ease of use; user interface; and code clarity and quality — and in two categories: Framing & Finishing; and Beyond the Bolts. First place winners in each category will receive a netbook computer for the parametric's author, and one free year of SDS/2 support for one workstation for the author's company. One of Design Data's main goals with SDS/2 Code Clash is to encourage the open-source parametric community to grow, share and collaborate. SDS/2 users can benefit greatly from parametrics written by fellow users that can be critiqued and enhanced by the entire SDS/2 parametric user base. Design Data will build and maintain a parametric module library, which will contain modules that can be shared and distributed with SDS/2, as well as on the SDS/2 Web site. Maintaining a library that contains useful Python modules that users can import into their own parametrics will help parametric writers — and other SDS/2 users — be more productive. 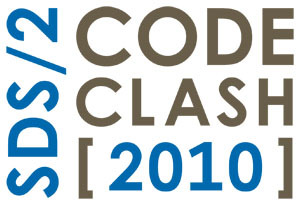 Additional information about SDS/2 Code Clash 2010, including rules, file submission requirements and parametric tutorials, will be available on sds2.com when the competition opens on July 12.